Children in Nonparental Care: A Review of the Literature and Analysis of Data Gaps Work-Family Supports for Low-Income Families: Key Research Findings and Policy Trends In the Running for Successful Outcomes: Exploring the evidence for Thresholds of School Readiness Technical Report Report to Congress: Aging Services Technology Study Child Care Quality: Does It Matter and Does It Need to be Improved? Bainbridge, J., Meyers, M. K., Tanaka, S., & Waldfogel, J. (2005). Who gets an early education? Family income and the enrollment of three- to five-year-olds from 1968 to 2000. Social Science Quarterly, 86(3), 724-745. Belfield, C. (2010). 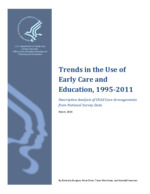 Early childhood care and education: Enrollment patterns and expenditures over the decade 1995-2005. Working paper. Bureau of Labor Statistics. (2012). Retrieved from http://www.bls.gov. Chaudry, A. (2004) Putting children first: How low-wage working mothers manage child care. New York: Russell Sage Foundation. Ertas, N., & Shields, S. (2012). Child care subsidies and care arrangements of low-income parents. Children and Youth Services Review, 34, 179-185. Greenberg, J. P. (2010). Assessing policy effects on enrollment in early childhood education and care. Social Service Review, 84(3), 461-490. Kinukawa, A., Guzman, L., & Lippman, L. (2004, October). National estimates of child care and subsidy receipt for children ages 0 to 6: What can we learn from the National Household Education Survey? Child Trends Research Brief. Laughlin, L. (2013). Who’s Minding the Kids? Child Care Arrangements: Spring 2011. Household Economic Studies. U.S. Census Bureau. Magnuson, K., Meyers, M. K., & Waldfogel, J. (2007). Public funding and enrollment in formal child care in the 1990s. Social Service Review, 81(1), 47-83. Magnuson, K., & Waldfogel, J. (2012, May). The role of early childhood education in changing income-related gaps in achievement. Paper presented at the Conference on Income, Inequality, and Educational Success. Center for Education Policy Analysis, Stanford University. Snyder, T.D., & Dillow, S.A. (2012). Digest of Education Statistics 2011. (NCES 2012-001) National Center for Education Statistics, Institute of Education Sciences, U.S. Department of Education, Washington, DC.